Today we’d like to introduce you to Nathan Cartwright. Thanks for sharing your story with us Nathan. So, let’s start at the beginning and we can move on from there. The Hive Gallery and Studios was created in 2005, by myself, Nathan Cartwright. I had been curating underground shows in what is now called the Arts District for about 4 years before starting the gallery at a place called Hangar 1018. This was one of the only places downtown to see music and really amazing, emerging artists in one large place. The Hangar had a few artist studios and I love working with others. Thus, The Hive Gallery became Hive Gallery and Studios, with in the beginning 14 working studios, and now over 35 working and exhibition studios. With 3000 square foot of space, I realized this was the best way to handle such a large space, having a front and middle room gallery and the rest, being working/exhibition studios. Like a Hive, we are a bustling community of artists, some of which who have been with me for 12 years! In the end, it has been smooth….as a business owner, you just need to tackle obstacles as they come, and not sit on them. Downtown is growing and evolving, and that means The Hive has to evolve with it! Alright – so let’s talk business. Tell us about you the Artist and The Hive Gallery and Studios – what should we know? I am an artist and was known more for my art in LA, than as a gallery guy. My artwork is mixed media sculpture ranging in size from microscopic narratives reliefs, all the way to 15/20-foot foam mural work (most of which can be seen in the Hive Gallery). I am proud to be a hotbed for the new and emerging artists of LA. I love my work…. I get to inspire, and fill my artists and attendees with light. There is nothing better than to be given the opportunity to “in-spire”. We are a completely independently funded and run gallery…. 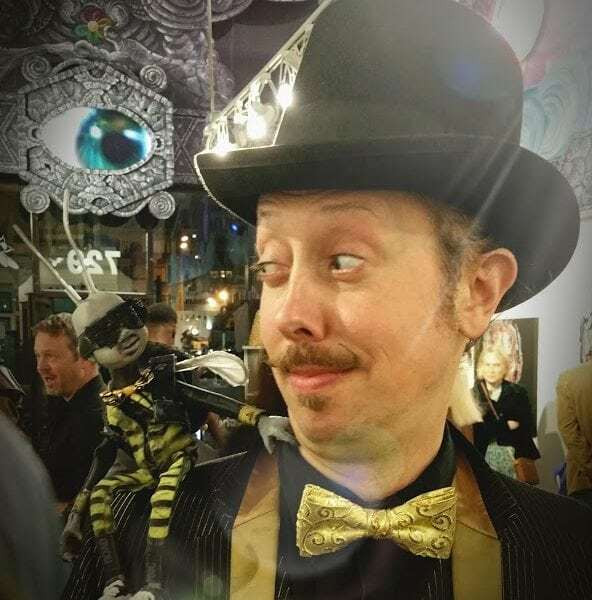 we now have shows every year in Japan, we’ve been voted Best Gallery in LA by several publications, we publish a yearly tarot deck (going on our 9th year of decks), and have had a new show every month for 12 years, making April our 144th show. I’m very proud of this! Flexibility, imagination and a sense of humor…….all mushed together create one VOLTRON of a characteristic for success. Artworks range in price at the Hive from $5 all the way to $5000, we cover all the bases for art collectors of all levels in the downtown area. Address: 729 S. Spring St.